Go and colleagues  compared the rates of major complications at cancer diagnosis for patients with a monoclonal gammopathy-associated malignancy (MM, Waldenström’s macroglobulinaemia and lymphoplasmacytic lymphoma) for patients with and without MGUS follow-up. Of the 17,457 study patients, 6% had a prior diagnosis of MGUS. 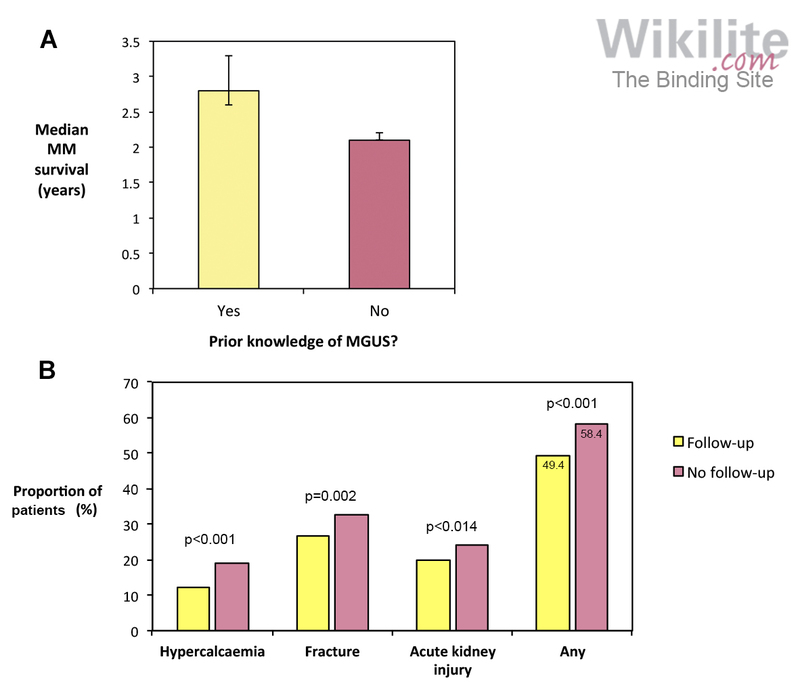 Patients with prior MGUS follow-up experienced significantly fewer complications, including acute kidney injury, hypercalcaemia and fractures (Figure 13.11B). Although both studies provide support for the practice of MGUS follow-up examinations, a recent commentary by Kyle and Rajkumar  stated that prospective studies are now required to confirm the value of MGUS follow-up and the optimal approach to monitor patients.